A jobsite radio or a worksite radio has already joined the collection of power tools due to its advanced technologies that were developed over time. These devices have become available for many users, making tasks easier, more convenient, and faster. With the best jobsite radio in the worksite or the workshop, there is no longer the need for the plaster splattered tape deck or the old paint to pump out the workers in the morning. Fortunately, the best sounding job site radio comes to the rescue, allowing many users to savor the digital quality audio right out of the kit box. Today, these power tools are operated on battery packs or on AC, maximizing their outdoor capabilities, especially in remote work sites, the deck or the patio that lacks electricity. With that said, below are the top-rated jobsite radio reviews that will help you understand the power of these tools, taking advantage of their abilities, features, and unbelievable options as the best worksite radio also functions as a music player through an MP3 or a smartphone, while others feature wireless Bluetooth connectivity. Among the best job site radio is the Bosch PB360S 18-Volt Lithium-Ion Jobsite Radio with an average rating of 4.5-Stars on Amazon. This Bosch power box radio features an AM and Fm radio, including four speakers and a subwoofer that projects sound in different directions. It is a superior 360° 26W stereo sound, which is operated by Bosch 14.4V or 18V lithium ion batteries. It measures 16 inches from top to bottom, 16 inches from side to side, and weighing at 25.5 pounds. Certainly, this work site radio offers high performance, producing a maximum of 26W of sound output. It is also a weather-resistant system with four innovative speakers that can produce high-quality sound, along with its subwoofer. The batteries are rechargeable through the unit’s integral battery charger, making it the most convenient, hassle-free, and the best portable radios. The Bosch powerbox radio also boasts a built-in Digital Media Bay with a powered USB port, MMC/SD card slot compatible, with two auxiliary inputs, a WMA and MP3 files stored on separate cards, CD player, and a portable satellite receiver through a 3.5mm stereo jack. This is among the jobsite radios that come in a deluxe version, offering up to 50W of power, including a SIRIUS satellite radio port, a remote control, a four-way GFCI power outlet, and a backlit control panel. Without a doubt, the Bosch PB360S allows the user to hear everywhere through its 360-degree premium sound and four speakers. Its portability is attributed to its rugged aluminum with a rubber roll cage that can likewise withstand extreme conditions. It is a powerful and small job site radio that can play everything via its advanced digital tuner, SD and USB ports, and its built-in and external auxiliary ports for satellite, CD, and MP3 players. Read our detailed review of the Bosch PB360S. With an average rating of 4.5-Stars is the Makita BMR100W FM/AM Job Site Radio, delivering rich stereo sound via its 2 powerful side-firing speakers that measure at 3 and ¼ inches. The BMR100W is durable and compact, according to a Makita jobsite radio review. It is also MP3 compatible and powered by a Makita 18V or 18V LXT lithium ion battery. Hence, this job site radio can complete the Makita LXT Series tools in the job site. This work radio’s design is sleek and versatile, featuring a digital backlit quart display. It has 10 stations presets, along with a clock, an off-timer button, and 2 3.25-inch speaker stereo systems. The kit also includes an AC adaptor, while running eight or 16 hours, depending on the battery used. This power tool only weighs at 9.2 pounds with a protective bumper design, combined with weather-resistant components. Moreover, the BMR100W has a retractable top-bar handle, making it very portable and a ready-to-go tool. The handle has a rubber grip for added comfort and protection, making it ideal for both indoor works and the rugged outdoors. Indeed, it is an epitome of Makita’s unwavering commitment to innovative technologies, and no less than world-class engineering. All in all, the BMR100W is in Makita’s lineup of 18V LXT Lithium-Ion Cordless Tool Series, which is the representation of the company’s cordless tool revolution. This series of products from Makita is certainly a game-changer, offering a wide array of cordless solutions for the professional tradesmen. And the BMR100W jobsite radio is no exemption to this. Read our detailed Makita BMR100W review. The Ridgid jobsite radio is among the best-rated worksite radios on the market today. Garnering an average rating of 4.5-Stars, this power tool features a ShockMount protective armor, which has been designed to absorb impacts throughout demanding job conditions. Job site radio reviews indicate that the Ridgid is the only worksite radio, specially designed to charge and play iPods through an exclusive docking station. This radio has the ability to change songs through an on-board external control at a maximum of 25-feet distance. Furthermore, the Ridgid can likewise play other music player brands via an audio patch cord, providing versatility on any job site all the time. This work radio has also created a lot of positive reviews from actual users of the power tool, saying that the iPod dock works great. It is indeed a major advantage over other job site radios today. The overall construction is rugged, tough, and built to last, based on other consumer reviews. Additionally, the Ridgid’s battery compartment serves a lot of purposes, not just limited to storing the battery. It can be used for storing other components on the site, like wires, splitters, and so on. The Ridgid ZRR84082 is close to indestructible, while sounding great at the same time. It is highly capable of offering plenty of loud noise outdoors and allowing the user to control the treble and bass. Overall, the Ridgid ZRR84082 is one of the most sought-after Ridgid radios in different work sites. Thus, it is sturdy, efficient, and reliable with a lot of useful features that any tradesman will surely love. Read our detailed review of the Ridgid ZRR84082. The Milwaukee portable radio is also a top-notch jobsite radio with an editor rating of 4.5-Stars. It is a digital contractor radio, which is constructed from ABS polymer and steel, providing optimum durability, either for home use or in tough job sites. For economy and versatility, this radio runs on A/C power or M12, NiCad 12V, V28, M18, or V18. Its USB compatibility feature can play music from an MP3 player or a smartphone, while charging small devices at the same time. It has a weatherproof compartment, keeping the music player and other components safe at all times. Moreover, the Milwaukee 2790-20 is a craftsman jobsite radio with a powerful 40W amplifier, including premium speakers. Everyone can surely enjoy the sound from this radio, allowing the user to choose between the 10 preset stations, plus customizable equalizer settings. Its digital processor tends to enhance the AM/FM receiver in delivering the best performance of a jobsite radio. In the kit is a bottle opener for added convenience and fun. Without a doubt, this radio makes use of an exclusive digital tuner, which is highly capable of delivering the highest reception, signal clarity, and accuracy for AM/FM bands. Among its selling points is its overall construction, which is made of steel and shock-absorbing polymer. Hence, it is perfect for indoor work sites, especially the outdoors. This construction radio is ideal and efficient to use in isolated areas. It can cover the collective noise of the outdoors, such as the sound of a tube bender. It performs brilliantly even at the half of its volume, clearly hearing the sound without any distortion. Furthermore, the Milwaukee’s compact design is just perfect to fit in a toolbox cabinet, getting it ready for a day’s work at the job site. This Milwaukee portable radio can run all day with fully-charged M-series Milwaukee batteries. Read our Milwaukee 2790-20 review here. Among the most reliable jobsite radios is the Dewalt job site radio with a 4.5-Star rating. This radio is said to save time, while getting more things done on the work site. It is a dual-function tool that provides efficient and quick NiCad or lithium ion battery charging, including an MP3 or radio-plug-in function. Its overall design is rugged, perfect in withstanding the most extreme work conditions. It also features digital controls, plus advanced functions, making the operation reliable and simple. Its portability is attributed to the 14.25-pound weight, making it one of the best portable radios. In a simplified form, this radio is a dual-purpose tool, serving as a battery charger and a radio at the same time. It is operated by between 7.2V and 18V Dewalt batteries without an available outlet on the work site. The Dewalt worksite radio charger also offers a 3-stage charging system, allowing a maximum battery life and run time. This feature alone keeps the users working without any interruptions. The 3-stage charging system of this radio also offers the optimum versatility, unlike other radios out there. It has an AM/FM tuner with bass, range, and LCD for no less than quality sound. Among the Dewalt work radios, this model offers 15 preset stations, a built-in clock, and an LCD display. All these features make the DEWALT DC012 the best Dewalt work radio ever created, considering its MP3 or iPod connectivity that allows all tradesmen listen to their favorite music, while at work. Hence, it is the most versatile Dewalt construction radio that exceeds the requirements of all tradesmen in different work sites. Read our detailed DEWALT DC012 review! For a rich and full-bodied sound, the Ion Audio iPA30 small work radio is very ready to pump up any work site. It offers an MP3 and smartphone connectivity, while offering AM/Fm radio at the same time. It is also compatible with other audio sources so long as a line output is provided. It has a tough construction, withstanding the use and abuse from consistent movements as well as jobsite dust. The corner bumpers and the integrated handles greatly prevent damage caused by falling objects. This radio can also stream music wirelessly via the Bluetooth connection for up to a 100-feet distance. The built-in battery is capable of providing a maximum of 50 hours battery life on a single charge. Moreover, this radio features a very durable wooden cabinet, large rubberized buttons, and controls that are very easy to use, even with hand gloves on. Indeed, the best job site is where with the Ion Audio iPA30 radio is, making every project more enjoyable than ever. This is the best site radio that is lightweight, weighing at only 20.8 pounds, while measuring at 12-inch by 14.5-inch by 15-inch in dimension. Many actual users express their love on this radio, saying that the sound is great, despite the loud noise outdoors. This power tool can also make hangouts and other gatherings more fun, not just limited to work sites. Among its selling points is the radio’s compatibility with smartphones and the long battery life. 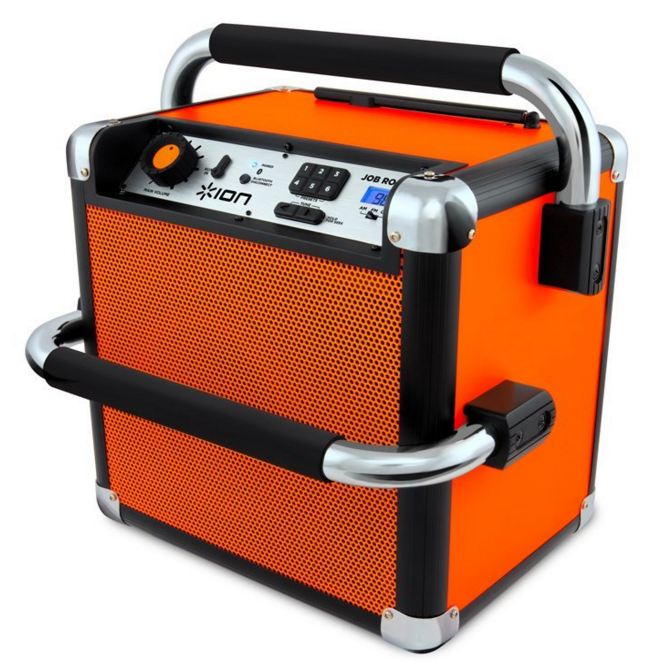 All in all, the Ion Audio iPA30 is the best battery powered radio for outdoor gatherings and work sites. Read our detailed review of the Ion Audio iPA30. After learning about the top-rated work radio reviews, it is now time to learn about the surrounding factors and features that will surely affect your decision-making. The trusted brands and manufacturers of the best work radios have been identified, considering the product ratings as well. However, the following information will help you narrow down the boundless selections, helping you decide the tool that will best suit your needs. READ: Is A 2 Gallon Air Compressor Right For You? The carrying handles of the best worksite radios are major considerations throughout the search and comparison task. Although it is a basic feature, it aids greatly to the portability of the tool. The selections on the market, just like the above-mentioned reviews, have different types of handles. However, the most popular and most practical one is the top-mounted handles that will surely come in handy in various situations. A worksite radio without a handle could give you a difficult time, especially during transportation. The audio and many other features of a jobsite radio are controlled by dials and buttons. But, some models may offer a different perspective and method. Today, the majority of these tools make use of a rotating dial for the volume adjustment, while others make use of up and down buttons. The Dewalt, and the RIDGID, for instance, have separate knobs working solely for the radio tuning. The recent models now have separate power on and off buttons, AM and FM mode selection, auxiliary input, clock display, radio tuning, and more. Most the buttons are rubberized for comfortable pushing, while larger buttons are sometimes found in other models like that on the Milwaukee portable radio. Meanwhile, other models have dedicated buttons to specific features such as the Bluetooth, presets, equalizer, and so on. The Bosch Powerbox radio and the Milwaukee feature a separate button for the mute option, letting you turn off the sound quickly. Most models, including the above-mentioned reviews, allow you to adjust the settings of the radio presets, EQ, and the clock by pressing buttons or scrolling through computer-like menus. Hence, you should identify the most convenient dials, buttons, and displays that will meet your needs, before even placing your order online. Make sure that the entire process will not frustrate you or confuse you either. All worksite radios have backlit LCD panel displays for the volume, sound source, frequency, and the time. In fact, most of these tools can show the time, even with the unit turned off. Many other models, such as the Dewalt radios display other information like the battery life, recharging status, and more. On the other hand, the Makita LXRM03B displays the date and time, including the built-in alarm clock and the snooze setting. The excellent construction site radios can display the Radio Data System (RDS) information, showing the radio station’s caller ID, while some models can show the artist’s name currently playing on the radio. While in search of the best radio on the market, the seek or scan feature is also worth-considering. Tuner scan and find functions help you in finding radio stations easier. The Makita worksite radio, for instance, has the seek feature that allows you to set the radio to the next station automatically by a simple press of the tune up or down button. The seek and scan features are very useful in finding the available stations. This feature comes in handy, especially if you are unfamiliar with the place. Whether it is a Dewalt jobsite radio or a Black and Decker radio, having a good reception is crucial. After all, the radio’s primary job is to pull in FM and AM stations. The radio should have a station-grabbing power without excessive distortion or chatter. Among the product reviews above, the Makita and the Ridgid jobsite box allow the user to switch the normal reception to mono, which is a great feature in helping weaker stations sound better as it reduces the annoying intermittent static. Added to your list of must-haves are the auxiliary inputs of the radio. This feature is the radio’s ability to play music from auxiliary devices, ranging from MP3 players to a CD player, smartphone, tablet, and more. A short cord is used and plugged into the stereo jack, which is standard in most portable electronics. On that note, the Makita work radio features a handier connectivity via a top-mounted dock, while the Bosch has sockets for thumb drives or SD memory cards inside its digital media bay. The Bluetooth connectivity is more than a cool feature. Although the Bluetooth signal has a limited range of about 100 feet, it is enough for playing music in your workshop from a portable device that is located inside your home or car. Device compartments are features in a jobsite radio that you should watch out for. Such compartments can house and protect auxiliary devices. Most of the reviewed products above offer a built-in and sealable compartment such as the Ridgid and the Ryobi dustbuster. The doors of the compartments also have rubber gaskets in keeping out dust, while the latches are very easy to open. The top-mounted compartment and battery bay of the Milwaukee has generated positive reviews and high Milwaukee radio ratings as well. Most compartments also feature built-in USB ports, while other models only provide USB power once the radio is plugged into the electrical outlet. This specific feature can become a drawback if you want to recharge your device at a site that lacks AC power. At this point, you now have a very good idea about the top-rated worksite radios on the market. The pros and advantages have been summed up for your convenience, allowing you to choose the most appropriate radio in accordance with your personal tastes and available budget. It is also important to take note of every factor on the buying guideline as each feature plays a crucial role throughout the performance and power of your jobsite radio. Keep in mind that a job site radio is an essential investment. It is sensible to choose between the above-mentioned products as these devices have been used, tested, and reviewed by actual users, personally testifying on the performance of each radio. Finally, never forget to pick a trusted brand and a reliable dealer, ensuring that you’ll receive no less than a genuine jobsite radio that will last a lifetime.